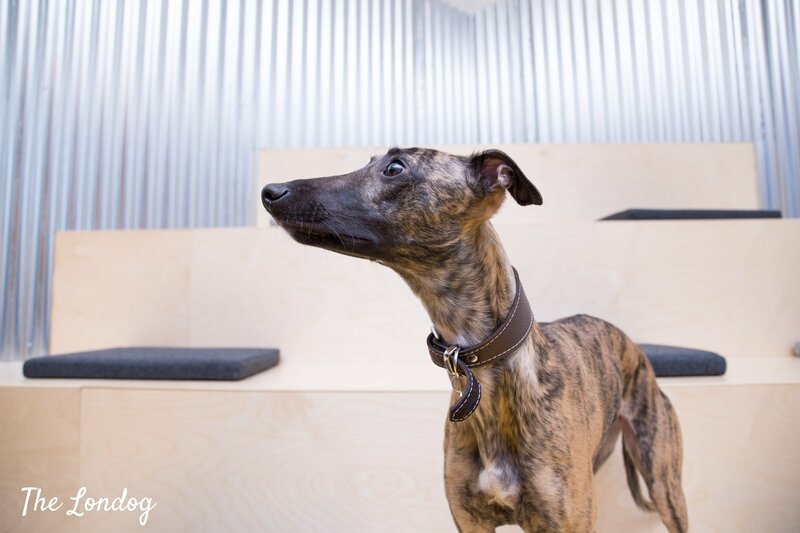 Thelma, the Kent-born 11-month old Brindle Whippet, started her career at Depop, an online marketplace for unique things, coming in a little bag at 10 weeks of age, and walking in by herself by her 14th week. 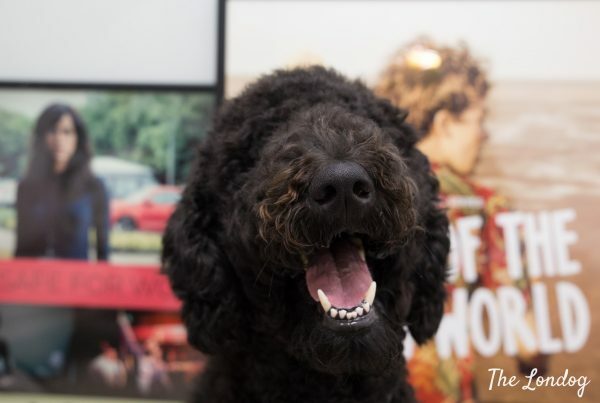 She features as Friday’s office hound in this 12th edition of the Office Dog Series. I walk down Curtain Road, in Shoreditch, looking for number 7-9, with my glasses steaming up as I breath wrapped up in a woollen scarf. 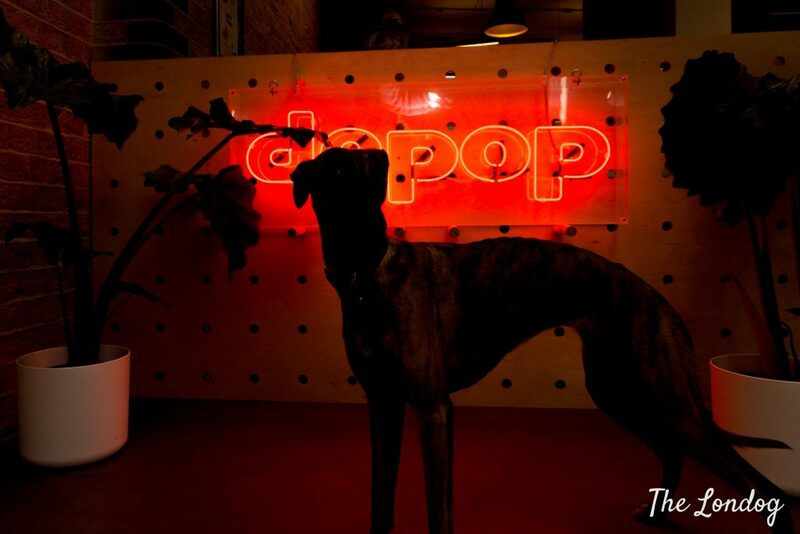 Polly had told me that Depop’s office is very easy to spot and peeking into a big glass wall, I see the red neon letters curling into Depop’s name. I walk in and, at reception, a friendly girl informs me that Polly and Thelma are waiting for me in the kitchen area, and raising my eyes I spot them in the back. Thelma is wearing a white and blue striped jumpsuit and becomes interested in my bag as I pull out my camera and treats. 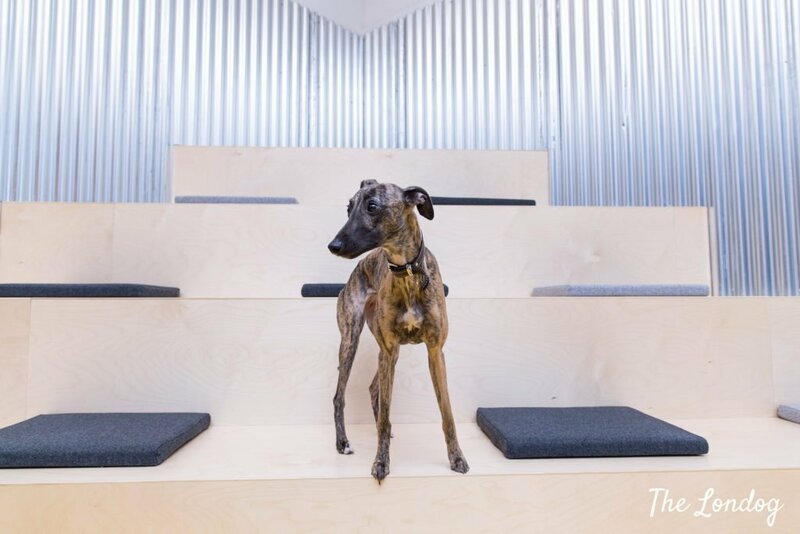 As I walk with Polly around the office, she tells me that they recently moved from a much smaller office in a warehouse to this new sleek place, still in Shoreditch. Depop is very proud of its new home, and has reason to, as there are cool areas, a wide modern open space with a large kitchen, colourful couches and carpets, and a great vibe. The new office was a bit of a surprise for Thelma. “Moving in to the new office, [she did] not realise the floor was slippy so [went] at full pelt – not stopping in time and slamming in to chairs and sending them flying,” recounts Polly. She soon found her feet into the new workspake and confidently sniffs around the office as I chat with Polly. 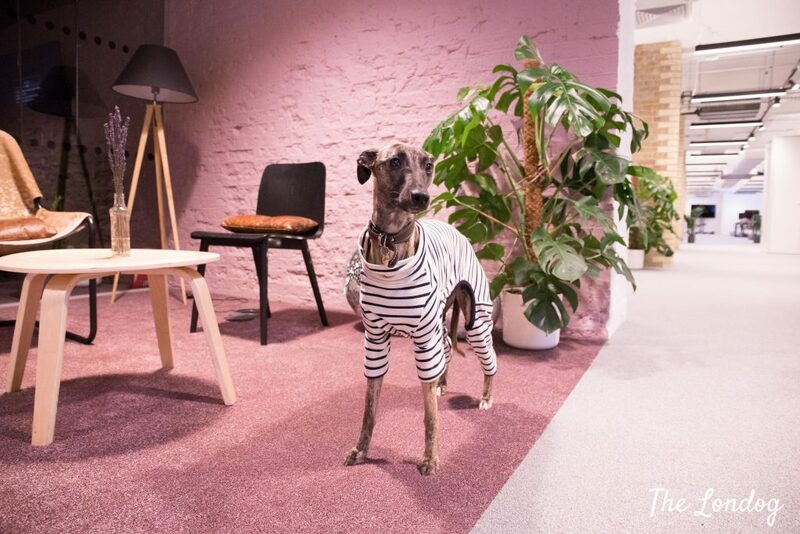 “She likes a specific carpet in one meeting room, she loves escaping to see if another dog is in the office (it rarely is), she likes the attention from her favourite people and will actively seek them out each morning to say hello,” lists Polly. In general, she has been enjoying office life. “Depop have been very welcoming to Thelma. 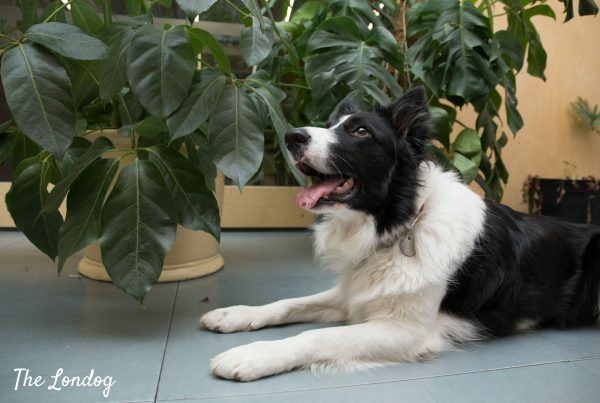 Many of the team find her funny and enjoy having her around, she trots around and sits at peoples feet nearer the kitchen, so she can see if any food is being dropped. She is super entertaining and as she likes a cuddle, quite therapeutic. She has had some moments where she hasn’t been as popular, when she was a bit younger and there was a less friendly dog in the office for a few months she used to escape and try to find it, and then cause a commotion if she found her. Some people in the office were not such big fans of this! There were times when she was super young that I’d go to the bathroom and she immediately would start loudly crying, thankfully she has grown out of that now,” recounts Polly. Shoreditch is quite built up, and Depop’s office is now closer to Liverpool Street. “We go out three times a day for a wander, we just moved away from a little park outside Shoreditch church but found a nice spot of grass for a run around outside the Hello Fresh office (thanks for having us!). There are lots of dogs in offices nearby so plenty of interaction on the routes we take and lots of shop keepers know her,” adds Polly. While we chat, Polly tells me that there is a new little pooch at the office, a Cavapoochon puppy whose crate is not far from the her desk. Thelma is very interested in it and – likely – in the toy which is locked into the crate, and during our time together she keeps wandering around it and staring at it. 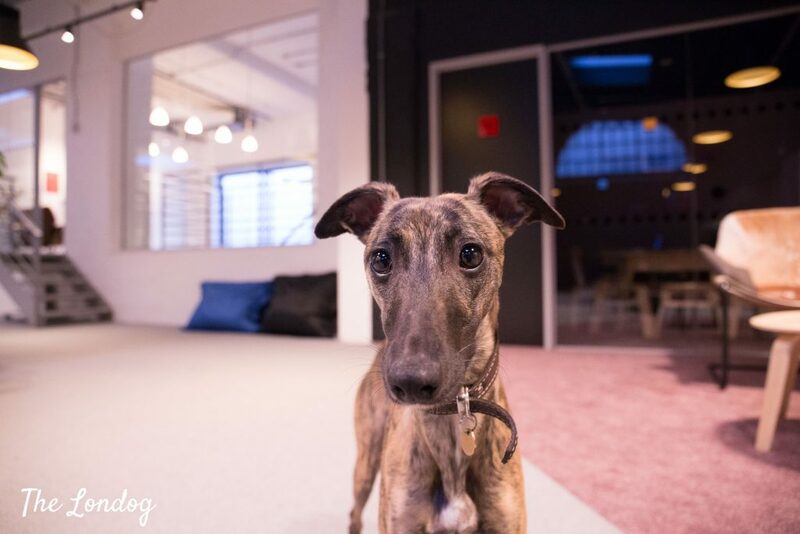 “Recently a few more pups have been coming to the office and been super popular, our Instagram is becoming quite dog-focused,” comments Polly. 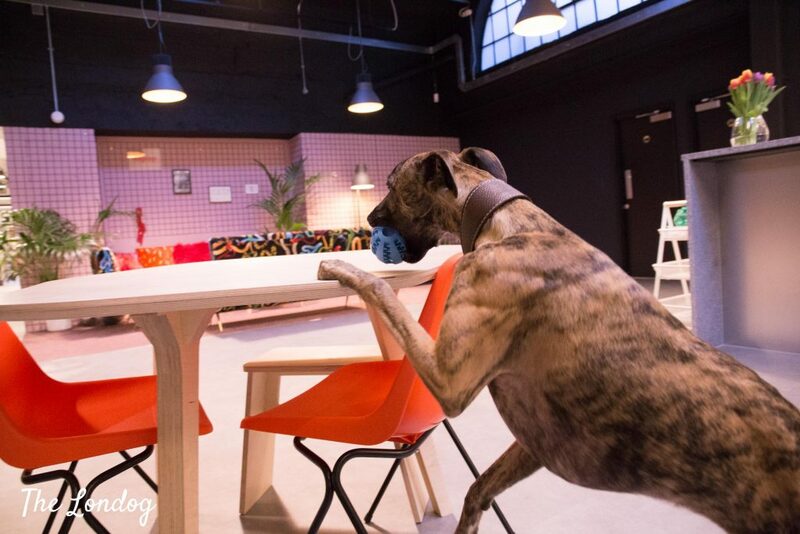 When Thelma arrived at Depop, they were already used to dogs, as Ernesto the pug had been there for a while. “They got on famously – they were quite the pair. Due to Ernesto there were basic rules in place, and although he’s moved on now, these have been adapted as we grow into a bigger company. There are a few people who do not like dogs being around, but luckily our office is big enough that paths don’t cross often!” says Polly. 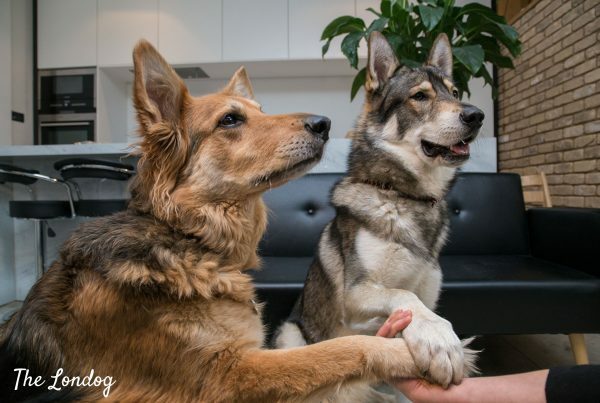 I have the chance of seeing this in action, as she immediately goes on leash as people who are not fans of canines walk into the office and she explains that there is a whole no-dogs area past the couches area. Thelma seems to know and respect that invisible line drawn to separate the areas. “Make sure your dog is house trained! There is nothing more embarrassing than when Thelma ran off and did a wee in a meeting room, in front of some very important people. Make sure there is a good dog walker nearby who can come pick them up and give their legs a good stretch!